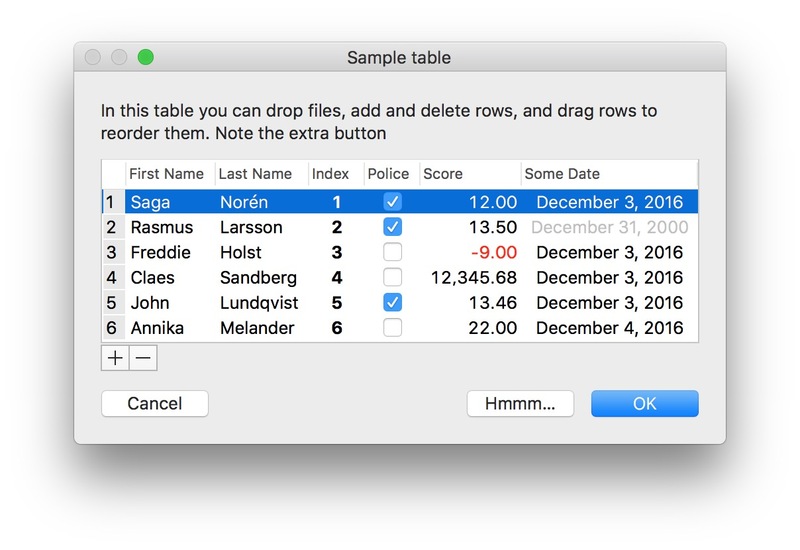 Myriad Tables Lib is an AppleScript script library that gives AppleScript scripts the ability to show dialogs containing tables. It requires OS X 10.10 or later. Note that scripts using Myriad Tables Lib cannot be edited in Script Editor in Mojave because of new security settings. You need to use Script Debugger. 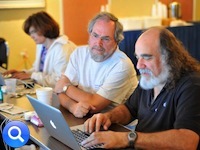 You can download Myriad Tables Lib plus samples and documentation here. PrefsStorageLib is a library that makes it easy for applets to store persistent values in their existing preference property list files using the standard application defaults system. This gets around the problem where applets cannot retain values between launches because they are codesigned, or locked to avoid repeated authorization dialogs. Works with macOS 10.11 or later, and can also be used with script bundle (.scptd) files. You can download PrefsStorageLib plus documentation here. Metadata Lib is a library for conducting Spotlight queries, as an alternative to the command-line tools mdls and mdfind via do shell script. Version 2.0 now includes a terminology dictionary, making it simpler to use. You can download Metadata Lib plus documentation here. Dialog Toolkit Plus is an ASObjC-based script library for showing enhanced dialogs. Add multiple text entry fields, checkboxes, popup menus, radio buttons, path controls, extra buttons, secure fields, images, and rules to dialogs. Dialog Toolkit Plus requires macOS 10.10 or later. You can download the libraries and documentation here. Note that scripts using SQLite Lib cannot be edited in Script Editor in Mojave because of new security settings. You need to use Script Debugger. SQLite Lib is a library for fast and efficient SQLite programming from AppleScript, based on the well-known open-source FMDB Framework. If you ever need to access SQLite databases, or need a simple database for your scripts, this is the answer. Read more here. Note that scripts using BridgePlus cannot be edited in Script Editor in Mojave because of new security settings. You need to use Script Debugger. BridgePlus is an AppleScript script library for use under OS X 10.9 and later. For typical scripters, it includes a collection of handlers based on the functionality of ASObjC Runner.app. 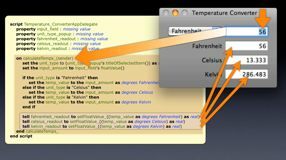 For AppleScriptObjC users, there are commands that support improved bridging between AppleScript and Cocoa, as well as direct access to the extended functionality. Read more here. Note that scripts using CalendarLib cannot be edited in Script Editor in Mojave because of new security settings. You need to use Script Debugger, or CalendarLib EC (see below). CalendarLib is an AppleScript script library for manipulating calendar events without using Calendar.app. 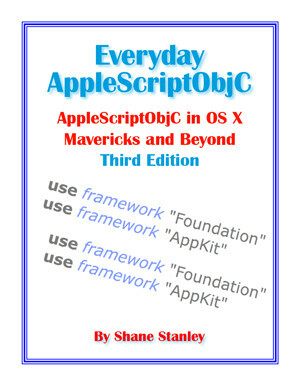 It requires OS X 10.9 or later, as well as the BridgePlus script library. * You do not need to have Calendar.app running. * It is much faster. Hugely so, especially if you have a busy schedule. * It does not support all the features of Calendar.app. Version 1.1 adds new command for retrieving multiple calendars. You can download CalendarLib plus documentation and BridgePlus here. * It requires El Capitan or later. * It does not require BridgePlus. * Several of the command parameters are optional. You can download CalendarLib EC plus documentation here. FileTagsLib provides a way of retrieving and setting file tags, something not available via either Finder or System Event scripting. You can download the library and documentation here. FileManagerLib provides handlers for file management tasks like duplicating, copying, moving, renaming, deleting, and trashing files, as well as creating folders and alias files, getting the contents and entire contents of folders, and sorting lists of files. Includes a terminology dictionary, making it simple to use. You can download the library and documentation here.